I have been on a sock-knitting kick lately. I suppose the colder weather and recent snow fall we've had have something to do with that. The striped socks on the right are for a friend who needs warm socks due to a bout with cancer. They were an experiment because it was a pattern that I sort of made up because he wears "sport" socks and I had not knit sport socks before. 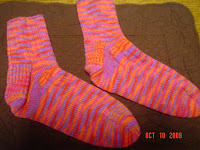 They are made out of Red Heart Heart & Sole Yarn in the "Rustica" colorway. The pink socks in the middle are made out of Oasis yarn that I purchased from the South West Trading Company. They are "soysilk" and knit up with a rather "heavy" feel to them. I am anxious to see how warm they are. 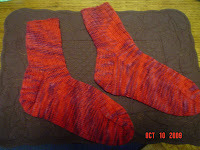 The red socks are a hand-dyed wool that I purchased at The Artful Ewe in Port Gamble, Washington. I love the color! 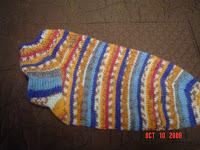 The pattern is my favorite - "Wide Wale" by Ann Norling.